This meeting will present the draft design concepts and recommendations for the corridor. 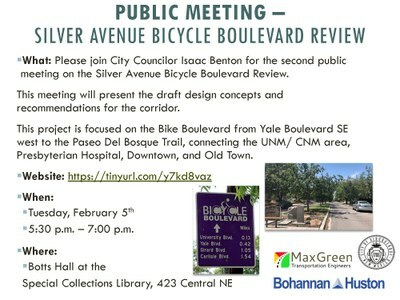 This project is focused on the Bike Boulevard from Yale Boulevard SE west to the Paseo Del Bosque Trail, connecting the UNM/CNM area, Presbyterian Hospital, Downtown, and Old Town. Visit the project web page for more information.